What is a "Fair Lead"? Taken most literally, a "Fair Lead" would make the most sense to an English Sailor, a great connection to my background. However, the Fairness runs deeper. My leashes are Fair in many ways. I pride myself on a Fair price, and all materials are sourced in the US. The robustness and tangle-free design keep the line Fair. It is certainly Fair to let your salty dog express his nautical style, and after all, every dog deserves a Fair lead. Jess is a Marine Scientist, Sailor, Conservationist, and Marlinspike Artist, originally from Cambridge, England. 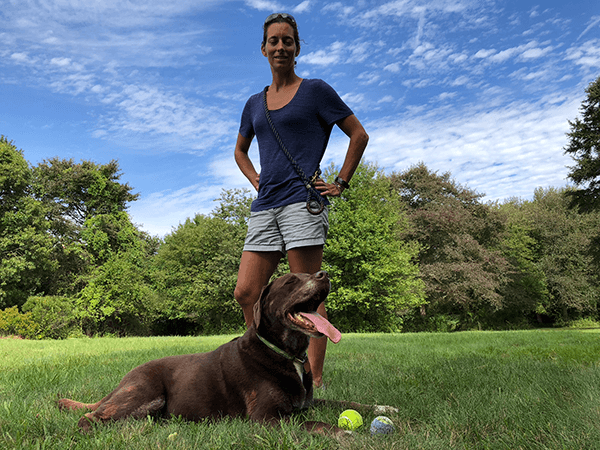 After 10 years of global travel and 40,000 nautical miles of round-the-world sailing, Jessica landed ashore in Rhode Island with her husband and Cadbury, their crazy chocolate lab. Fair Leads were inspired by a love for sailing, for animals, and for unique high-quality products that are pure in form and simple in function. All leashes and collars are hand-made by myself in Jamestown, Rhode Island from locally sourced and produced materials. How strong are the leashes? All products are made from marine grade rope, with breaking strengths of well over 3,000lb. The rope is durable, weather and water resistant and long lasting. The rope is made from polyester/nylon and is tougher and more abrasion resistant than 100% cotton leashes on the market. The splices are sturdy hand-tied with (5 tucks) using a historical technique used by sailors but are used here to secure the handle and clip. All products are extremely durable and suitable for all situations particularly around salt water and beach conditions. The hardware is high-quality marine grade solid bronze, it does not rust, even with regular contact with salt water. The brass may tarnish over time and exposure to salt water. This does not affect the functionality, but a quick polish with a product like Never Dull® or a combination of lemon juice and baking soda can bring the shine back. What is the ring for on the Classic Leashes? The bronze ring attached to handle is versatile for poop bags, keys, or to clip the leash to itself over your shoulder when your dog is playing off the leash. How long are the leashes? Standard length of all leashes is 5ft. But as leashes are typically made to order different lengths can easily be accommodated. Additional length can be added for $1/ft. What size leash should I buy? For dogs over 110lb even the thinnest rope is strong enough, but aesthetically, some think the thicker rope looks better on larger dogs. The diameter of the classic standard leash rope is ½”. I do not have thicker calypso leashes. For dogs under 20lbs, the 3/8″ diameter is recommended and I also use lighter hardware for these leashes. How do I select the right collar? There are two different collar styles: 1. Fixed length (ring on one end and clip on the other), and 2. Slip style (two rings and a collar that tightens with tension). Please be sure to select the right style for your dog. Sizing Guide: Wrap a thin, flexible dressmakers tape around your dog’s neck where you want the collar to sit, or if you don’t have one, use a piece of string, or thin rope – then lay it out flat and measure how long it was. For slip style collars make an allowance to ensure it will fit over your dog’s ears (collar should be quite snug as it fits over the ears to prevent it slipping off). The measurement is often not correct if you just measure your dog’s old collar because of the thickness of these collars. Custom orders are always welcome. I enjoy working with customers to design their perfect and practical leashes and collars. Past customizations have included; Various lengths from 1-25 ft, Multiple Dog Couplers for 2, 3 or even 4 dogs, Stainless Steel Clips, Horse Lead Ropes, Herding and training leashes, Wall and crown knots, or extra handles, for closer control. Do you make them for horses? Yes, I have made a number of horse leads. Please contact me to design something that would be practical and suitable for your needs. Do you have other colors? All of my standard colors are listed online here, occasionally I do have some few leashes in other colors. My colors are limited to those used in the marine industry. Please contact me if you have a particular request. Why do the ends of the splice stick out a little when new? We melt our leashes at the perfect length so that after a little bit of use, the rope ends-blend into the splice, but not so close that it comes untucked easily with use. Under normal use, all products have a lifetime warranty on craftsmanship and materials. My dog chewed through mine can I get a replacement? Fair Leads are made from high-quality, marine-grade rope which is relatively hard to chew through compared to other leashes. But replacements are not offered if your dog chewed through the leash. If your dog is a chewer I would recommend spraying your leash with a bitter apple deterrent spray while they are in training. Products are typically made to order and ready to ship in 5-7 days. Products are shipped USPS First Class and take 1-3 days to arrive. Yes, I currently offer free shipping to Canada as well as the USA. Shipping to most other countries is between $15-20. Please contact me directly for shipping estimates. Yes, as long as the product has not been used. Praesent accumsan, nunc eget semper cursus, tellus nisl sagittis massa, vel egestas erat odio sed sapien. In malesuada ipsum ut elitpretium. In a luctus tellus. Fusce id euismod justo. Vivamus ullamcorper, lacus at congue feugiat, metus justo fermentum mauris Etiam rhoncus enim non nulla posuere bibendum et non lacus. Aliquam rhoncus vel metus vel elementum. COPYRIGHT © FAIR LEADS. ALL RIGHTS RESERVED. Good news RI residents! All Products are now exempt from sales tax!